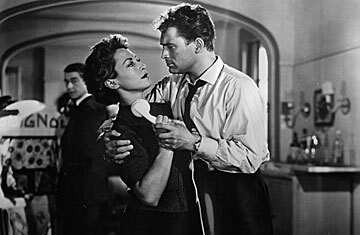 Marie Sabouret and Jean Servais star in the French heist film Rififi, directed Jules Dassin. Esteem is a perishable commodity among filmmakers; directors lionized in their prime fall from grace into ignominy or, worse, anonymity. The movies stay the same; only the social fashions change. Of Jules Dassin, who died this week in Athens at 96, you could say he was the prime developer of the movie crime caper, and leave it at that. His 1955 Rififi, with its wordless, minutely-detailed, half-hour jewel robbery, and the 1964 Topkapi, with an even more elaborate heist, inspired dozens of imitations, in films from The Killing, Ocean's Eleven and The Italian Job to The Usual Suspects, Mission: Impossible 2 and that mini-masterpiece of stop-motion animation, Wallace & Gromit in The Wrong Trousers. If some star is hanging from a rope over riches protected by a sophisticated alarm system, there's no one but Dassin to thank for it. An official remake of Rififi is due out next year, with Al Pacino. But the crime movie was just one item in the dossier of this fascinating, hard-to-pin-down ex-pat auteur. And Dassin lived long enough to watch the fickle swing of fortune's pendulum over and over until the movement became almost routine. It was as if he were a character in one of his heist films: top of the world one minute, disgraced and disconsolate the next, but always angling for the next big break. Dassin directed some important, and still fascinating, noirish films in the late 40s: Brute Force, The Naked City, Thieves' Highway. Then he got blacklisted by Hollywood and settled in Paris. After four idle years Dassin achieved international renown with Rififi; he won the Director prize at the 1965 Cannes Film Festival, where he met his future wife, the actress Melina Mercouri. They made nine films together, including his biggest success, Never on Sunday. That romantic comedy, with the director playing a naive American grecophile and Mercouri as the Athens whore who liberates him, landed Dassin two Oscar nominations, for director and screenplay. In 1964, Topkapi also proved quite popular. But that was his last hit, 44 years ago. Critically, too, Dassin was up and down, and then out. He was the first blacklisted director to earn a secure reputation in European films, and under his own name. (Another American exile, Joseph Losey, was making films under pseudonyms.) When the young critic Francois Truffaut saw Rififi, he wrote, "From the worst crime novel I have ever read, Jules Dassin has made the best film noir I have ever seen." Dassin's Euro-movies had a vogue among middlebrow U.S. reviewers, who might have thought he was French. (Pronounce it Zhool Da-saaan.) The hipper critics knew better. He was "strained seriousness" to Andrew Sarris. On seeing Phaedra  an updated Greek tragedy that threw Anthony Perkins into the arms of stepmother Mercouri  Pauline Kael compared it invidiously to a Bette Davis weepie. Both were making the same point: that art isn't only what comes from Europe, and that kitsch wasn't a Hollywood monopoly. No genre has a quicker sell-by date than self-important melodrama of the elevated sort. And despite the heist films and the ostentatiously life-hugging Never on Sunday, Dassin's main mood was serioso in his films with Mercouri. "Together," writes David Thomson in A Biographical Dictionary of Film, "they made some of the most entertaining bad films of the sixties and seventies: pictures that outstrip their own deficiencies and end up being riotously enjoyable as one waits to see how far pretentiousness will stretch. In good company, and a little drunk, He Who Must Die, Phaedra, and 10:30 P.M. Summer might cure would-be suicides. There are those who found Never on Sunday charming, and Topkapi exciting. They must have been very drunk." Who, after reading Thomson, would dare say they enjoyed these movies sober? It was DVD that revived Dassin's rep  not for the Mercouri films but for his early-prime crime pictures. (Film noir is a genre that never goes out of favor.) The Criterion Collection lavished its legendary care on editions of Brute Force, The Naked City, Thieves' Highway, Night and the City and Rififi. And when that film was briefly released in theaters in 2000, it won a special award from the New York Film Critics Circle. Yet a bunch of Dassin's major Euro-pix, including He Who Must Die, The Law and Phaedra, and his late-60s urban drama Up Tight!, remain unavailable on DVD. Some of his movies are so hard to find, they have not a single review posted on the Internet Movie Database. Julius Dassin was born in 1911 in Middletown, Ct., and raised in Harlem. He acted in New York's Yiddish theater and directed plays on Broadway. Starting in 1941, he did seven years under contract at MGM, where his very first film showed at the very least that he was a gifted mimic of a great young master. Dassin's 20-min. version of The Tell-Tale Heart, released in late Oct. 1941, was possibly the very first movie to be influenced by Citizen Kane (which came out less than six months before). This short film, with Joseph Schildkraut as the guilt-stricken killer, is positively a-swill in Wellesian tropes: the crouching camera, the chiaroscuro lighting, the mood-deepening use of silences and sound effects. But MGM wasn't a studio that encouraged innovation or eccentricity, and Dassin's seven feature films there are program pictures that hold no, repeat, no hint of his future gift for putting torment and teamwork on film. Of this bunch (and, yes, I watched all of them), the 1942 The Affairs of Martha is an all-too-frantic suburban comedy. Reunion in France, which opened within a month of Casablanca, has a similar plot  Paris society belle Joan Crawford is tempted to leave her Resistance-hero husband for American airman John Wayne  but it's miscast, risibly implausible, your basic botch. In The Canterville Ghost (1944), Dassin's job was to referee between two shameless scene-stealers: Charles Laughton and the seven-year-old Margaret O'Brien. If there's a magic moment in any of these features, it might be the climax to Two Smart People (1946), where gunzel Elisha Cook, Jr., falls dead off a balcony during Mardi Gras and lands on a firemen's cloth hoop held by the crowd of revelers, who gaily keep bouncing the corpse into the air. You could take that as a metaphor for Dassin's years at MGM.